Stock # U0W02804, Intercooled Turbo Gas/Electric I-4 2.0 L/122, Automatic, 7751 mi. CARFAX 1-Owner, LOW MILES - 7,751! PRICED TO MOVE $4,600 below NADA Retail! xDrive40e iPerformance trim. Moonroof, Nav System, Heated Seats, Power Liftgate, Panoramic Roof, Aluminum Wheels, All Wheel Drive, Non-Smoker vehicle AND MORE! 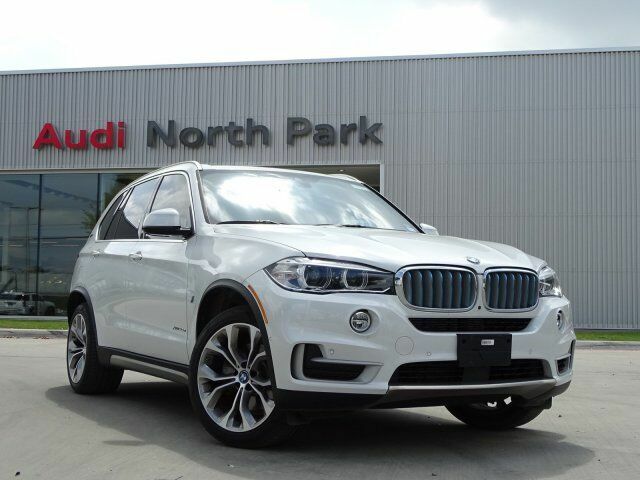 Navigation, Panoramic Roof, Power Liftgate BMW xDrive40e iPerformance with Mineral White Metallic exterior and Mocha interior features a 4 Cylinder Engine with 313 HP at 5000 RPM*. Rear Spoiler, MP3 Player, Sunroof, All Wheel Drive, Onboard Communications System, Aluminum Wheels, Keyless Entry. Non-Smoker vehicle. "Not only is the interior warmly appealing, it provides abundant space for five adult occupants. Cargo space is plentiful, totaling 23 cubic feet with rear seatbacks up, expanding to 66 cubic feet when they're folded." -newCarTestDrive.com. This X5 xDrive40e iPerformance is priced $4,600 below NADA Retail.